The third round of the 2018 FIM Superbike World Championship will be a special one for the Spanish-based KRT team as their riders Jonathan Rea and Tom Sykes take part in the first European-based event of the season, at Motorland Aragon this coming weekend. With the KRT squad based in Barcelona for many years now the Motorland Aragon round is the closest WorldSBK venue to the team’s headquarters. That in itself makes any Motorland weekend something notable for all in Kawasaki’s official WorldSBK effort, and there have been several notable Aragon race successes to celebrate. Current WorldSBK points leader and three-time champion Jonathan Rea has scored two wins and seven podiums in all in Aragon. Since joining the KRT squad in 2015 Rea has never finished off the podium at the venue located close to the town of Alcaniz. 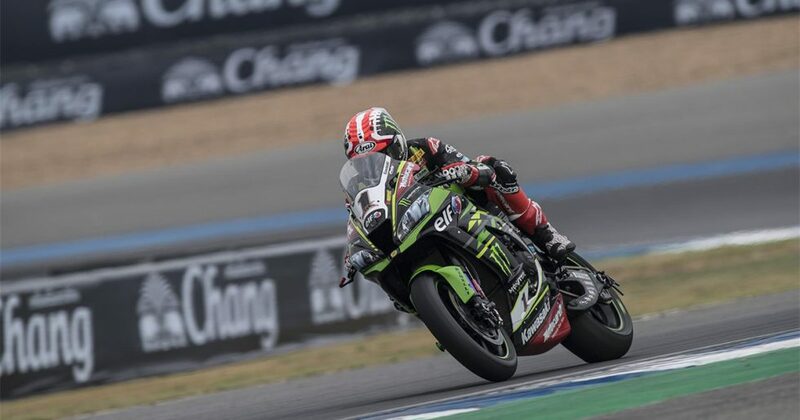 After winning race one at Buriram recently, Rea is closing in on record holder Carl Fogarty’s total of 59, with a his winning tally now raised to 55. Sykes has scored a double win at Motorland for KRT, in 2014, and was on the race one podium last season. Strong practice performances in the opening two rounds this year have not quite been converted into the ultimate results Sykes was aiming for. With second place in the first race of the year his individual highlight so far Sykes is currently seventh overall, but only 26 points from the championship lead. One more Superpole qualifying success this year and Sykes will go from joint record holder, currently tied with Troy Corser on 43, to the stand-alone record holder. With new WorldSBK technical regulations brought in this season to reduce the maximum allowable revs – regulations that have affected Kawasaki more than the other manufacturers at present – Rea and Sykes will continue to optimise their bike set-ups in Spain while also competing for valuable points. After two rounds held at the ‘fly-away’ venues of Phillip Island and Buriram, a return to competition at the well-established Motorland Aragon circuit starts a sequence of five rounds in Europe. After the completion of the Spanish weekend the entire WorldSBK paddock will immediately relocate to the north of the Netherlands, with races at Assen on 21st and 22nd April.